I Heart Cooking Clubs (IHCC) is cooking with a new selected chef, Heidi Swanson starting this week, for the next six months. Heidi Swanson is a cookbook author, who focuses on whole, natural food using fresh produce that are seasonal and minimally processed. 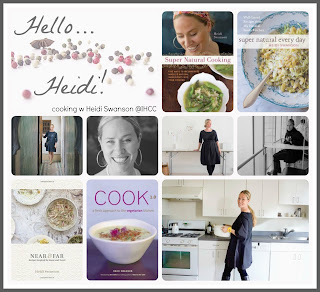 To know more about Heidi Swanson, you may visit her lovely website at 101 cookbooks and also to view her delicious vegetarian recipes. Come join us! More details here. This week, we are free to cook any of Heidi Swanson's recipes, to welcome her to our kitchen. I have some homegrown kale that is right for harvest, and found just the right recipe from Heidi's blog, Garlicky Greens. Fresh from the garden, into the cooking wok half an hour later. The leaves are shred to bite-sized pieces. This is a quick stir-fry dish. Best prepare just before serving. Heat some olive oil in a skillet (I've used a wok), add the salt and kale leaves, stir for 2 to 3 minutes, then add in lots of chopped garlic. Stir for 30 seconds or so, remove from heat, and stir in a big pinch of crushed red pepper flakes. There's an optional ingredient, Parmesan, which is to be stirred in at this point. But I have omitted the Parmesan, preferring to eat the Kale with its fresh flavours. I had the Garlicky Greens with some leftover couscous, top with a fried egg, for a light and satisfying lunch. I'm really looking forward to cook with Heidi Swanson for the next six months! Hold off cooking the greens until just before eating. Then, in a large skillet heat the olive oil. Add a couple of big pinches of salt and the greens. They should hiss and spit a bit when they hit the pan. Stir continuously until their colour gets bright green, and they just barely start to collapse - two, three, maybe four minutes, depending on how hot your pan is and how much structure your greens have. Then, just thirty seconds before you anticipate pulling the skillet off the heat, stir in the garlic. Saute a bit, remove the pan from the heat, stir in the Parmesan, and add a big pinch of crushed red pepper flakes. Taste, add a bit of salt if needed, and serve immediately if not sooner. First time to your space,lovely blog Joyce and nice clicks. yumm... your kale looks a lot like a local green we have, not the usual bunch type. Este plato es lo más rico con verduras orgánicas,saludable y super exquisito,abrazos. This recipe is such approachable and healthful way to eat more vegetables, especially when they are fresh from the garden. Yum! We don't have any kale looking like yours. In Northern Germany it's time for curly kale, I'll try this recipe with it.